Increasing usability reduces the amount of time that it takes users to master your product and decreases your support and training costs. Usability testing enables you to identify and correct usability problems within new products and focus development resources for new releases of existing products. Effective usability testing is based on a clear understanding of your application's or web site's business goals and user population. Before testing begins, GUI Designers work with you to formulate an appropriate usability testing strategy. An expert review is a "short, sharp" review of your product by a usability expert. The review concentrates on identifying usability problems based on an understanding of usability design principles. Reviews are often undertaken at your site with members of your product team. Questionnaires provide a powerful mechanism for evaluating the "health" of an existing product or web site. A questionnaire can be distributed by mail, e-mail, or over the web. Focus groups provide an ideal forum for testing market acceptance with groups of users. A focus group often involves reviewing the merits of design alternatives. Task based testing provides the most detailed feedback on a product's usability. Each user works through a predefined set of tasks at their workplace, or in our usability laboratory where they can be video-taped. 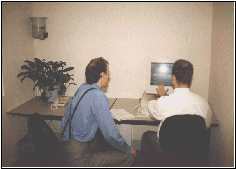 A usability expert observes the user and notes any difficulties that they experience. Testing is performed with at least six users. Following the completion of usability testing, GUI Designers prepare a report that details our findings and provides recommendations on how to improve your user interface. Where required, GUI Designers can assist with improving the design by working on-site with your product team. To find out more click on one of the example projects in the right hand bar, or contact us.